My birthday is coming up in a few weeks, and I’ve decided to celebrate my birthday in a new way this year. Since I’ve already shared a wish list and can’t buy anything for myself until after Christmas, I’m going to instead buy some fun gaming gifts for other people. Each week for the month of November, I’ll give a prize away to a randomly chosen person who either follows @glimmsworkshop on twitter or likes the Glimm’s Workshop page on facebook. The prizes will be different each week, and I’ll announce the winners on Fridays. 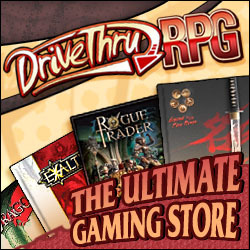 To kick off the gift giving, this week’s prize is a $10 gift certificate for DriveThruRPG that’ll be given out tomorrow. Happy gnomish birthday! The first winner was @HairyDM. Next Friday, I’ll be giving away a pdf of the Marvel Heroic RPG.